Hi Crossworld! Thrilled to be making my debut. My fascination with crosswords started at an early age; as a kid I cut my teeth on Newsday puzzles in my hometown of Baldwin, NY. At some point when I was 8 or 9 years old, I remember trying to construct my own puzzle. The only thing I recall about that attempt was that it included the answer OMS, which I clued as "Orange Mammal Society." I know - so many questions. None of which have good answers I'm afraid. Years later I turned to crosswords as a diversion during a 90-minute commute to NYC every morning, but as a technologically-challenged Xennial, it never occurred to me that an NYT app existed. So there I was, crammed in with grumpy Long Islanders like a human rebus, bumping along towards Penn Station trying to write my answers legibly in a copy of Will Shortz's Wittiest, Wackiest Crosswords. Eventually, I realized that I could be doing puzzles on my phone instead. I downloaded the app and was stunned to discover that I suddenly had access to 20+ years of NYT archives. After plowing through hundreds of puzzles, I started toying with the idea of making one of my own. Three years and seven submissions later and here we are. I must take a moment to thank Will and team for their patience and encouragement along the way. It would have been easy to quit after multiple rejections, but they were always careful to call out some positive feedback and leave the door open for future attempts. Once I settled on this particular theme, I set out to find the most colorful entries that would fit the mold but was constrained by a self-imposed rule that both sides of the [AD] be valid standalone entries. The four themers didn't end up as snazzy as I would have liked, but I hope that some of the livelier fill makes up for it. As a personal bonus, I was happy to be able to incorporate my wife's name (32D) and birthstone (15A). I was also pleased to see that roughly half of my clues made the cut, including my faves at 38A, 8D, and 27D. One final note – I tried every which way to put the revealer at 63A or 64A and failed miserably. Three P's and a U in the bottom row = permanent dents in my wall and forehead. The 61A/62A row was no picnic either. Moving the revealer to 8A took all that pressure off and allowed me to load up on some interesting 7-letter entries, albeit at the expense of saving the revealer for last. From the solver's perspective, this seemed like a worthwhile tradeoff. I hope you agree. Happy solving folks! Hope to be back soon. Debut! Fun play on POP UP ADs, the letters A and D "rising" over black squares. A perfect find for our favorite CAN AD IAN, Jim! I'm curious how many neighbors up north ever noticed that curious parsing find. I also like how the ADs were so smoothly integrated into solid long entries: AVOCADO, SIDE ROAD, BREADED – NOT SO BAD, indeed! A lot of constraints to work with, given the parallel structure of paired themers like AVOCADO / ROPE A DOPE. Michael went big, with wide-open, tough-to-fill corners. Some LOONIER fill resulted, with the tough ORINOCO and the bizarre ZAMUNDA. 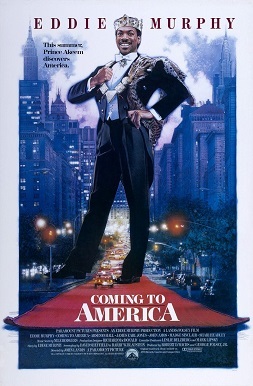 I've seen "Coming to America" maybe half a dozen times, but I still had to stare at the finished entry to make sure it seemed like it could be a word. I waffled between that and ZEMUNDA (ELO seemed as realistic as ALO as a phone greeting). Relieved that I guessed right! Fully agreed with Michael, that the revealer at the top wasn't great. At first, I thought it ought to be easy to place at the bottom right. Not with MILL fixed into place, though! I do think 56-Across could have been a better possibility. Interesting theme idea overall. I do wish more of the themers had been 1.) more interesting base phrases, like ROPE A DOPE, and 2.) the chunks resulting from parsing had all been as solid as CAN and IAN (OPE and TRE, I see you). Maybe ... CAR RADIOS to CARR AD IOS? MORTADELLA to MORT AD ELLA? POMPADOUR to POMP AD OUR? I bet there are more. The grid uses 22 of 26 letters, missing FJQX. Average word length: 5.17, Scrabble score: 295, Scrabble average: 1.59.